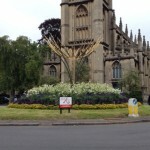 Bath & North East Somerset Parks department have been busy planting around the Ironart Sun Flower sculpture on Bathwick Hill. 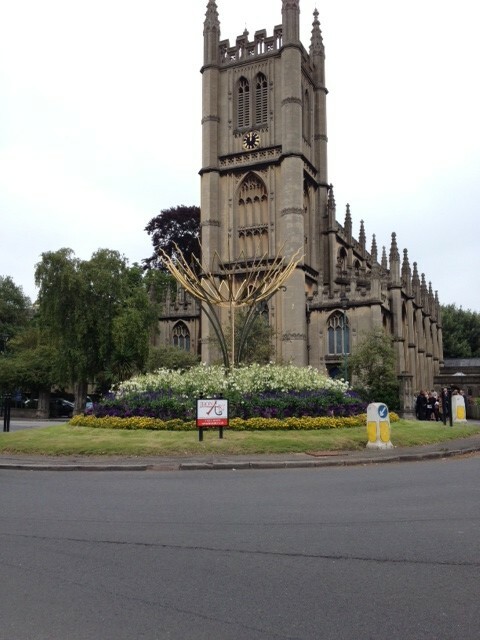 It’s great to see it looking so radiant in the summer sunshine after months of bare earth and dreary weather. It gets a big thumbs up from all of us, hope you’re enjoying it too! 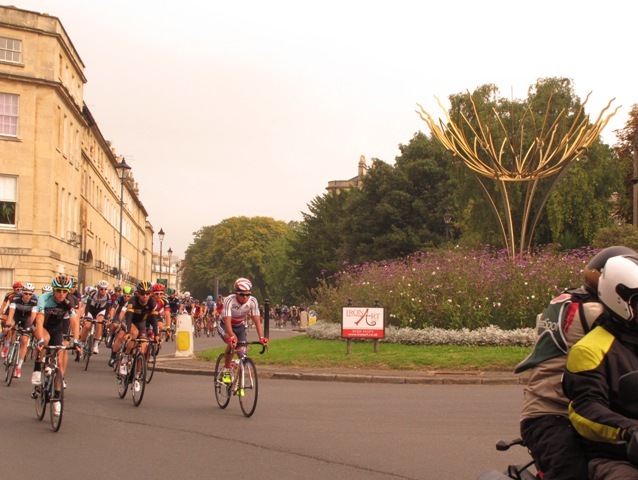 On Friday the sixth stage of the Tour of Britain bike race kicked off in Bath. As many of you will know (the Wiggo sideburns are a dead giveaway) cycling is something that is very close to Andy’s heart – so no prizes for guessing who took full advantage of this wonderful photo opportunity! 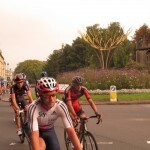 Ironart’s Sun Flower was perfectly positioned as a backdrop as the peloton raced along Great Pulteney Street, zoomed past the sculpture on the Bathwick Hill roundabout, then headed off along Pulteney Road and out of Bath towards Bradford on Avon and Trowbridge. It was over in a flash, but it was a very beautiful moment. Please spread the word……It’s FOR SALE! It’s anticipated that it will be in situ for 12 months. 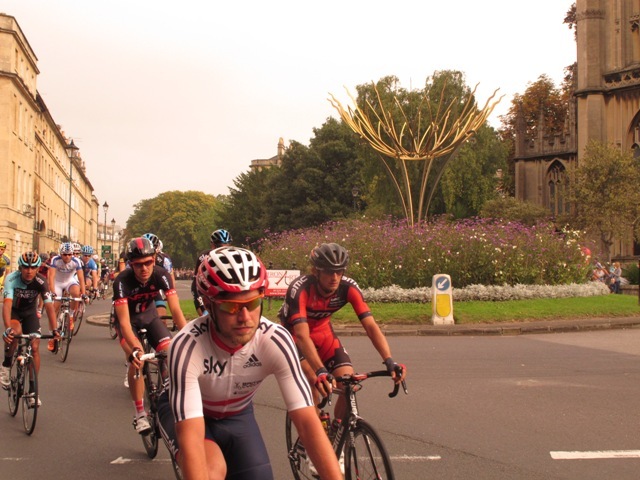 Ironart and BathNES Council are looking for a company or individual to secure it for the future within the City. The sculpture carries a price tag of £20,000 + vat, but is offered at £15,000 + vat by Ironart to secure it as a piece of public art for the city. Interested parties should contact the Ironart team on 01225 311 273. More (really techie) information about the Sun Flower sculpture! 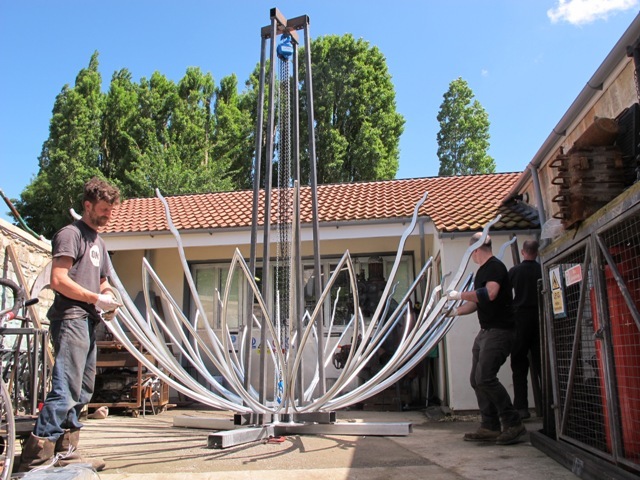 The Ironart Sun Flower stands 4.7m high x 4.5m at its widest point and weighs approximately 750kg. It was made in mild steel which has been galvanized. It stems from a 450mm base which is attached to 1800kg of underground ballast to stop it keeling over! The supporting legs are 70 x 20m rectangular sections which were cold rolled with ends that were tapered and scrolled in the forge. The legs are secured to the foundation metalwork by 2 no. M16 bolts per leg. The flame details are a combination of 50 x 10mm and 50 x 20mm sections which have been cold rolled then hand-shaped, with hot forged ends. 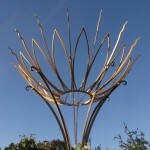 The petals are constructed from 34mm heavy wall tube which were rolled, mitred and welded. Leg/flower connections have been made with 50 x 13mm metal collars with 3 no. M10 bolt fixings. Absolutely everything was done in the Ironart Larkhall workshop by our skilled team of artist blacksmiths with the exception of the cold rolled 70 x 20mm legs which we outsourced due to their size. The legs are finished in a combination of Bronze Green and metallic paints from the Ardenbrite range. The stripes are in Light gold and Copper. The flower petals in Green Gold, the flames in Sovereign Gold. The tricky installation was carried out by a team of five people, using a purpose-built 4.5m high gantry bolted to the foundations, with a block and tackle combined with good old fashioned man power and ingenuity! Many hands on deck this morning as Andy put the Sun Flower sculpture together for the first time. 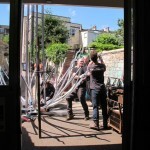 The whole team here in the workshop were involved, with some head-scratching and problem solving along the way. The sculpture looks incredible and will look even more striking once painted. All feeling very excited about this project, which will be the second piece of public art that we’ve had on display on the Bathwick Hill roundabout. The sculpture is for sale and we are looking for someone to fund it’s permanent installation elsewhere in the City in 2015. Please contact us on 01225 311723 if you would like more details about this.